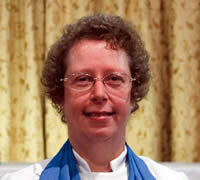 Susan Leighton – Licensed Lay Minister (Reader), Safeguarding Officer, assisting with Pastoral Care. My background is that of health care and I have recently moved from working in an elderly residential care setting to working with people of all ages in and around their own homes. I visit, socialise with and take Home Communion to those unable to get to church, and have frequent contact with those unconnected with any church or community of faith. I completed my Reader training in 2006, though have continued to study to work towards a degree in Practical Theology which I aim to complete by summer 2013. I am involved in preaching, in leading Evensong and the occasional services at St John’s on roughly a monthly basis. The most recent role I have taken on is that of Safeguarding Officer for Keswick St John’s. Outside of my work and Church life I am married to David, have two married daughters and a son who is in the Army and seen action in both Iraq and Afghanistan. The outworking of my Christian faith within the local community has led me to become a councillor on Keswick Town Council, so I am concerned with all the issues which affect our town and the residents and visitors.